Big Finish: Doctor Who - THE CONTINGENCY CLUB Review | Warped Factor - Words in the Key of Geek. Tony sips a brandy and considers his cards. In London in 1864, the world of the Gentlemen’s Club was everything you’d expect of a Victorian hierarchy – the clubs were exclusive, and yet intensely acquisitive of the most ‘clubbable gentlemen’ – leaders in their fields, so long as those fields were respectable or could be made to appear so by the transfer of large endowments. They were secret, private places, where very often, little went on bar the regression of the nation’s leading men into enclaves of even greater comfort and congratulation than they encountered in their daily lives. They were places to which one escaped from the cares of the world, from the nagging of one’s wife, from the demands of one’s family, from the pursuit of energetic pleasures. Places where one could sit with other chaps, have a tolerably good dinner, a smoke and a drink in convivial male company, perhaps play a game of cards and simply be oneself with one’s friends. They were essentially privately policed jewel-boxes of masculine, conventional pleasure. As such, you can see why the idea of them gave writer Phil Mulryne the idea to base a Doctor Who story inside the walls of such a club. Within the walls of a Gentlemen’s Club, what you have is a world enclosed, divorced from the law and order, divorced, should it want to be, from the morals and ethics of the outside world. So long as the secrecy of your members about what went on inside could be guaranteed, then technically anything could happen in a Gentlemen’s Club. When the Fifth Doctor, bless him, decides that he’s been trying and failing to get to Heathrow Airport for too damned long, and maybe, just maybe, something’s deliberately trying to stop him, the Tardis ‘falls out’ of the vortex in the newly-established hottest club in London – the Contingency Club. In itself, that would be nothing to worry about, though it would need an explanation. But the first scene of Mulryne’s new story makes it clear that all is not strictly gentlemanly in the Contingency Club – who or what, for instance, is the mysterious ‘Red Queen’ to whom members must swear allegiance as part of their initiation? And why, come to that, does that initiation have to take place while in a mesmeric trance? What is it about the Club that requires that kind of deep obedience and secrecy…? At first glance, nothing, it seems, but Mulryne’s no fool when it comes to plotting – within the first episode, he gives us half a handful of things to worry about: a member who’s gone missing from the rest of the world, the reason why the Contingency has such swift at-seat service, and how Nyssa and Tegan can stand inside it without causing a riot being just some of them. When a degree of hell breaks out in the Club, the traditional burden of the ‘full Tardis’ is neatly tackled, the Doctor and Tegan being forcibly ejected and literally bumping into a man with a somewhat unhealthy interest in becoming a member, while Nyssa and Adric equally literally run into the daughter of the missing member, and decide to go swanning about in some subterranean tunnels. Word to the wise – never go swanning about in subterranean Victorian tunnels if you can help it. You can hide armies down there, and of course, many species have done over the centuries of Who-lore. The latest of them at least explain one of the Contingency’s unique selling points as a place of relaxation for discerning gentlemen. But as the drama unfolds, you get less interested in running away from things, even things as persistent as what’s down in the tunnels, because there are more interesting central things going on. For neither the first nor the last time, Big Finish’s contact book puts many TV drama companies to shame. The much-vaunted Red Queen is played by Lorelei King with a relish that makes the character more than just what she appears – and she already appears to be plenty. There are elements of the name, the plotting, and the personification of the character that punch through from the situation in which (ahem) King’s Queen finds herself to other great popular fiction, and that for an agreeable while makes Who-fans think of beings we’ve seen that had similar needs for diversion much earlier in the show’s history. It would be certainly true that, to borrow from Lewis Carroll, the Red Queen is ‘the cause of all the mischief’ in the story, and as in any good game of chess, there are two queens at play in this story – and a king to boot, as well as a seeming army of pawns and at least one bishop on either side of what is laid out like a battlefield of hidden mines, Mulryne being unafraid to present several levels of his storytelling at once. That’s one of the most impressive points about the scripting of this story – it moves at a thrumming pace, and then, while it’s moving, and you’re dancing around in Victorian circles trying to find the lady, the whole thing grows and separates, adding dimensions as it moves. The cast also brings in two of Britain’s best character actors in key roles – Philip Jackson as Mr Peabody, the nominal secretary of the Club, and the ever-joyous Clive Merrison as Mr George Augustus, he who wants in to the Club, but can’t get an invite. King, Merrison, Jackson and Alison Thea-Kott as Marjorie Stonegood, the daughter with the tunnel-fixation, raise the game of this release even above usual Big Finish standards, and the joy is that they take roles that Mulryne has made rich and fully-fleshed. You want extra joy? Not a problem, because here’s the weirdest thing about these characters – yes, they’re rich, yes, they’re fully-fleshed, and yes, every single one of the actors knocks them out of the park, but they also maintain a degree of mystery about what’s actually going on that lets at least a few of them spin forward to potential future adventures. And we want them – we want to know more about the Red Queen and the gambit she’s involved in here. We want to hear what she does next, and we want to know more about her genuine opponent in this story. More Mulryne, more Red Queen, whole different story to follow up, please Big Finish. Oh and yes, in case you’re wondering, there’s a valid reason the Tardis falls out of the vortex. And while it starts out as an oddity, the reason turns out to be central to the resolution of events at the Contingency Club. 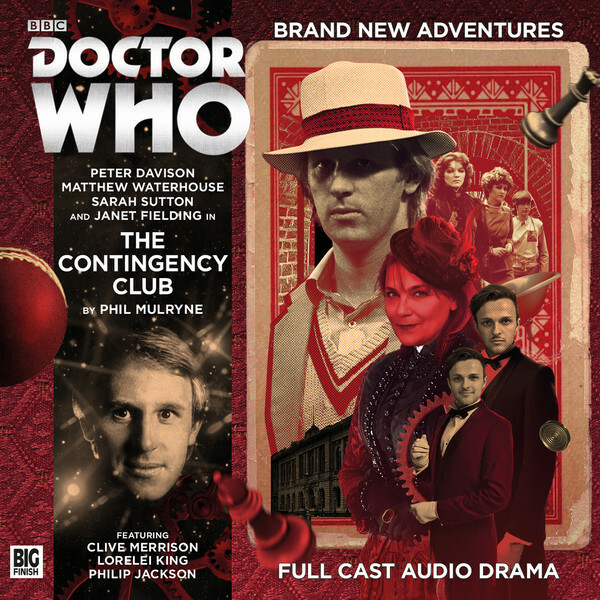 The Contingency Club is one of those Big Finish stories that’s actually a symphony – it starts like Mozart, barely anything, and then grows and swells, beyond anything you imagine it has the wings to do. Mulryne’s script is cleverer than you imagine, and richer, and the combination of the casting and the direction by Barnaby Edwards turns it into exactly what the Gentlemen’s Clubs were – an exquisite puzzle box, a beautifully upholstered mystery, and a time capsule against the outside world. Get The Contingency Club today and lock yourself in. You’re going to love it.